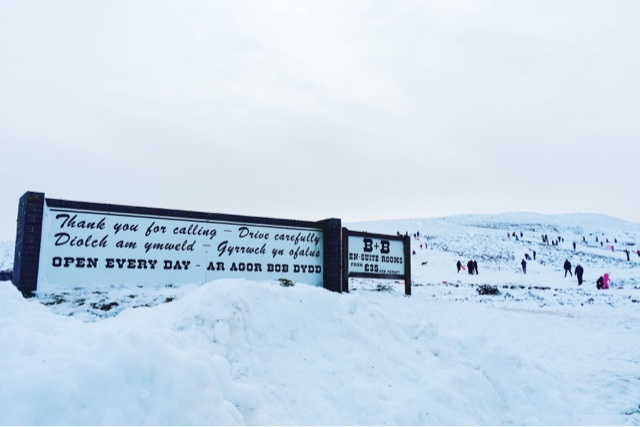 We decided to wrap up warm on a snowy Saturday and explore the gorgeous area around Llangollen in North Wales! With scenery like this, who could resist? Yesterday was my mum's birthday, and all week she'd been looking forward to spending the day up in the Lake District. However, after checking the weather forecast and realising this probably wasn't a good idea (unless we wanted to risk getting stuck somewhere in deep snow), we had to have a bit of a rethink. Living in Cheshire, we're very lucky to have a lot of lovely scenery in day tripping distance. As such, we've explored a lot of North Wales over the years, and Llangollen in particular is somewhere I visited a lot growing. I was surprised, then, when we managed to find some spots we hadn't been to before! 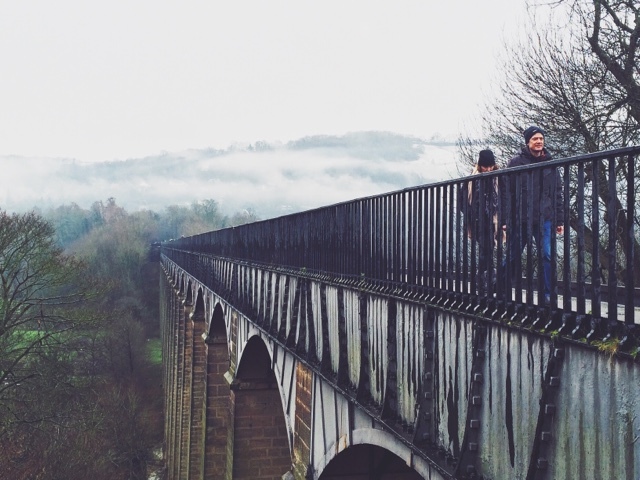 First stop was the Pontcysyllte Aqueduct, a world heritage site that lies between Wrexham and Llangollen. Built by famous engineer and architect Thomas Telford in the early 19th Century, the aqueduct carries the Llagollen Canal over the valley of the River Dee. We've driven passed signs for the aqueduct so many times and always said we'd take a look someday, but from the road you don't get any clues of just how incredible a structure this is. After short walk from one of the nearby car parks, following the canal, the valley opens up before you and the full scale of the aqueduct is revealed. It really is an impressive feat of engineering - when the aqueduct opened in 1805, it was the tallest canal boat crossing in the world. Even if architecture isn't really your thing, I'll be very surprised if the views from the top don't take your breathe away! After wandering across the aqueduct and back (and stopping to watch some brave kayakers paddling through the icing water! ), we were in need of something to warm ourselves up. So, we drove onwards to the centre of Llangollen, in search of a cosy looking coffee shop. What we found was even better! Llagollen has long been a favourite of tourists and day trippers, so it isn't short of places to eat and drink. While wandering about, we came across The Corn Mill, a beautiful pub with views over the river. The impressive building has been there since the 13th century, and was a working mill up until 1974. What really blew us away, though, was the food. We were only really looking for a snack and a coffee, but everything on the menu sounded so good that we couldn't resist getting full meals. I had a lamb and leek hash, and oh my gosh it was one of the most delicious things I've ever eaten, no exaggeration. We will most definitely be going back. Full and thoroughly warmed up, we had a bit of a nosy around the town centre before heading back to the car. Just around the corner from The Corn Mill, we found Harley's Vintage Boutique, which had a really gorgeous selection of tweed jackets, printed dresses, skirts and shirts, amongst other items. It was so well stocked, I couldn't belief I'd never been before! I'm still a bit skint after Christmas/New Year, and so restrained myself from buying anything, but I've definitely made a mental note to return when my funds are less scarce. ...yep, it seemed like all the kids in North Wales had descended on this patch of land! We shouldn't have been surprised, really, as this part of the pass is home to a cafe and a large car park. In other words, it's the perfect spot for families to base themselves for a day of snow-based fun! I remeber going sledging there at least once when I was little, though I don't think it was anywhere near as busy. On this occasion, we didn't stay too long - partly because it was starting to get dark and we had over an hour-long drive home ahead, and partly because we weren't really dressed for dodging sledges and snowball fights! I think the moral of today's trip is no matter how well you think you know an area, there's always somewhere new to explore! Do you agree? This place looks so gorgeous like a winter wonderland! Belated happy birthday to ur mom! Following you on bloglovin and cant wait for your next post! Woaaah, look at all that snow! I really want to go to North Wales, it's just too far to go in a day, I'd need to make a long weekend of it. Great Post! Enjoyed reading your post! Keep it up Love! oh wow i've only ever been to Llangollen in the summer but it looks absolutely beautiful in the winter too! I always love exploring places nearby! That's why I'm always trying to explore the UK. I really love North Wales, it is such a beautiful part of the country!